They call him Migaloo, meaning “white fella”, and this big fella seems to like it up here. Every year since 1991 the 14m whale has been known to head for warmer waters on his annual spring vacation with thousands of fellow humpbacks as they take a break from their Antarctic base. 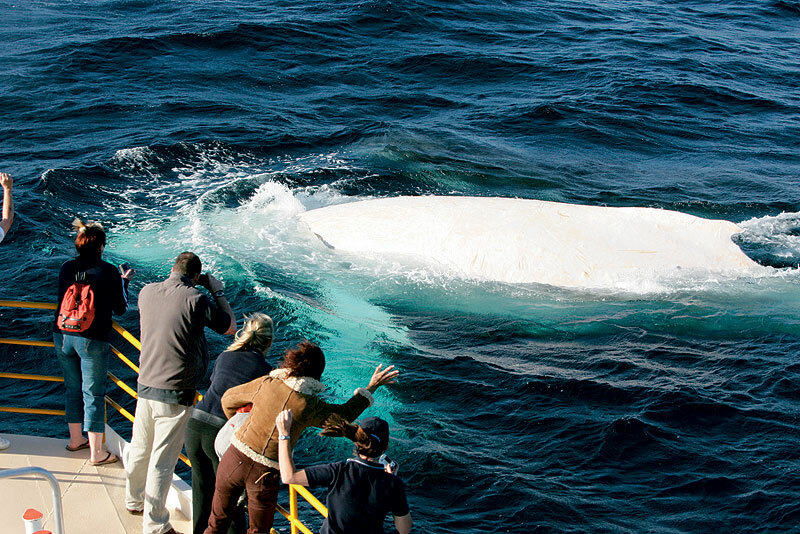 Migaloo’s claim to fame is that he’s the world’s only known white whale – and if you’re lucky you might spot him as he heads north to the Great Barrier Reef in autumn each year or back home again the following spring. He’s easy to identify, of course, and sightings are numerous. Because of his rarity, boats are prohibited from coming within 500m of him – and we even know “he” is male after a genetic test in 2004 when researchers at Lismore’s Southern Cross Uni were able to collect sloughed off skin samples as he playfully breached on his way back home. That was a first, too. Never before had researchers taken genetic samples from an albino whale or dolphin. Did you know? // In 2007 a record number of humpbacks (estimated around 10,000) were sighted from Point Lookout on North Stradbroke Island on their annual migration.